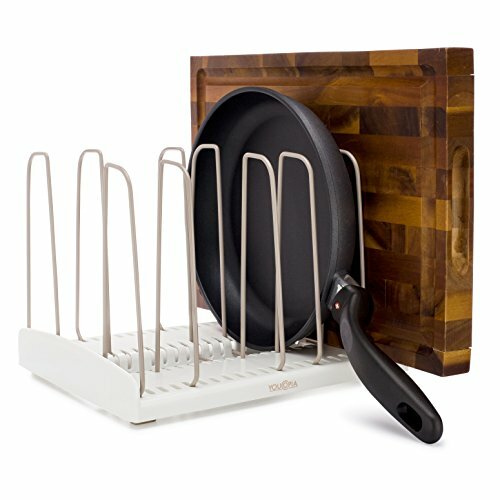 The StoreMore Cookware Rack organizes heavy pans, platters and lids, including cast iron, in a lower cabinet or pantry. Customize your space and stay organized! Six steel wire holders can be adjusted every half inch for a perfect fit, so you can easily find and remove one item at a time. Simply place the rack inside your cabinet, insert dividers and then your items. There is no mounting or installation required. Vertical storage helps maximize space and protect your valuable cookware and serving pieces from chips and scratches that occur with stacking. Strong wires won’t pop out and round pans stay centered in the base. Soft, non-slip feet hold the unit firmly in place. The Cookware Rack helps home cooks customize their cabinets and organize their kitchen! Slightly deeper than the StoreMore Bakeware Rack, the Cookware Rack measures 9.3? D x 11.5? W x 8.4? H (23.5 x 29.2 x 21.3 cm). YouCopia creates innovative home organization products to help you simplify and enjoy life. Just what I needed! This rack was the perfect rack to organise my pans in my cupboard! It was exceptionally easy to assemble and I put the dividers in as I went along to make it fit how I wanted. The only downside it the base raise the pans up about an inch so my largest pans didn’t fit so I just propped them next to it against the side of the cupboard and I still can’t get over what a difference it has made for my cupboard and sanity!